We investigated membrane proteinase 3 (mPR3) expression during TNF-α–induced adhesion of neutrophils in the presence of anti-PR3 antibodies, a situation occurring during anti-neutrophil cytoplasmic autoantibodies (ANCA)-associated vasculitis. Three increasing levels of mPR3 expression were observed on the mPR3+ neutrophil subset after stepwise cell activation. TNF-α activation without adhesion, TNF-α–induced adhesion, and adhesion in the presence of anti-PR3 mAb or human anti-PR3 ANCA resulted, respectively, in a two-, seven-, and 24-fold increase of mPR3 levels. In plasma, anti-PR3 antibodies poorly recognized suspended neutrophils, whereas they bound to mPR3 on adherent cells. mPR3 upregulation was also triggered by IL-8, formyl-methionyl-leucyl-phenylalanine (fMLP), and neutrophil adhesion to activated human umbilical vein endothelial cells. It involved β2 integrins and Fcγ receptor, because it was prevented by anti-CD18 antibodies and was not observed with anti-PR3 F(ab′)2. Furthermore, it was specific to anti-PR3 mAb, and no mPR3 upregulation was observed with anti-myeloperoxidase or anti–HLA-ABC mAb. Newly expressed mPR3 molecules, after TNF-induced adhesion, were mobilized from secretory vesicles (CD35+) and secondary granules (CD11b+). The adhesion- and antibody-dependent upregulations of mPR3 expression occurred with little azurophilic granule degranulation, no sign of apoptosis, and no further CD177 upregulation. In conclusion, this study describes an amplifying loop in polymorphonuclear neutrophil activation process, whereby ANCA are involved in the membrane expression of their own antigen during cell adhesion. This could explain the restriction of ANCA-associated vasculitis to small vessels, the main site of neutrophil adhesion. Adherent neutrophils are surrounded by an area where protease inhibitors, such as A1AT, are inactivated by neutrophil-derived metalloproteases.23–25 We hypothesized that mPR3 becomes accessible to ANCA in the presence of plasma during neutrophil adhesion to endothelial cells, as found in vasculitis. We thus analyzed PR3 membrane expression during PMN adhesion induced by TNF-α in the presence of anti-PR3 antibodies, as seen in the microvascular environment of vasculitis patients. TNF-α is known to trigger adhesion-independent and -dependent neutrophil responses. 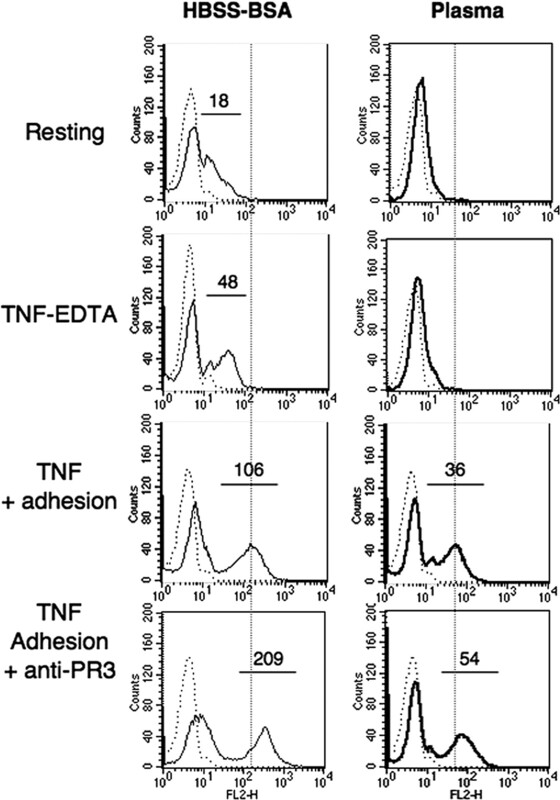 The addition of EDTA distinguishes the effects that are caused by TNF-α per se from those that result from TNF-induced integrin engagement and “outside-in” signaling.26 We analyzed mPR3 expression on TNF-activated PMN from individuals with varying proportions of PMN expressing PR3 (mPR3+; Figure 1A). Membrane proteinase 3 (mPR3) expression after TNF-α–induced PMN activation and adhesion. (A) Representative flow cytometry histograms obtained with polymorphonuclear neutrophils (PMN) from three healthy donors with 80% (left), 40% (middle), and 0% (right) of mPR3+ PMN. PMN (2 × 106/ml in HBSS-EDTA in BSA-coated tubes) were incubated at 37°C for 45 min (Resting PMN) or, after 15 min at 37°C, for 30 min with TNF-α (20 ng/ml; TNF-EDTA). PMN (2 × 106/ml in HBSS2+-BSA) were allowed to settle for 15 min at 37°C in 1% gelatin–coated wells and incubated with TNF-α (20 ng/ml) for 30 min at 37°C without (TNF + Adhesion) and with 2 μg/ml anti-PR3 mAb (TNF adhesion + anti-PR3). The anti-PR3 mAb was previously centrifuged for 20 min at 12,000 × g to remove Ig aggregates. After washing off nonadherent cells, adherent cells were released by a 20-min incubation with ice-cold PBS, 1% BSA, 10 mM EDTA, and 0.1% sodium azide. Resting and TNF-EDTA cells were similarly incubated in 0.1% sodium azide before neutrophil labeling with anti-PR3 mAb (solid line) or control IgG1 (dotted line) and PE-labeled secondary antibody. (B) Synthesis of 22 experiments performed as described in A (means ± SD of mPR3+ subset mean fluorescence intensity [MFI]). ***P < 0.001. TNF-α activation without cell adhesion, in HBSS-EDTA, doubled the mPR3 level of the mPR3+ neutrophil subset (Figure 1). Similar results were obtained with TNF-α activation in HBSS−, with or without shaking (data not shown). When neutrophils were allowed to adhere to gelatin-coated plates, upon activation by TNF-α in HBSS2+, the mPR3 level was further enhanced, reaching 7 ± 3-fold the resting cells level (Figure 1). We analyzed TNF-α–activated neutrophils in the presence of anti-PR3 mAb to mimic further the situation occurring in ANCA-positive vasculitis. As expected, TNF-α induced 58 ± 23% PMN adhesion, which was increased to 65 ± 21% in the presence of 2 μg/ml anti-PR3 mAb (data not shown).14,15 Surprisingly, the presence of anti-PR3 mAb throughout adhesion resulted in a stronger mPR3 upregulation, reaching 24 ± 15 times the level of resting mPR3+ PMN (Figure 1). We excluded an in vitro artifact related to cell incubation with mAb at 37°C, allowing a more rapid antibody binding than during the labeling performed at 4°C. The antibody concentration was not limiting, because the mPR3 upregulation was similar with 60 ng/ml anti-PR3 mAb (n = 3) instead of 2 μg/ml. Moreover, incubation of TNF-activated adherent PMN for up to 2 h at 4°C with the mAb, to improve PR3 labeling, resulted in <10% increase of anti-PR3 binding (data not shown). This could not explain the 2.5-fold increase of mPR3 expression observed when the antibody was present during adhesion at 37°C. The mPR3 levels summarized in Figure 1B refer only to the mPR3+ neutrophil subset. TNF-α activation had no effect on the mPR3+ neutrophil percentage, and the mPR3− subset remained mostly negative during neutrophil activation and adhesion. It is worth noting that some mPR3 was detected on the mPR3− subpopulation as a result of TNF-induced adhesion in the presence of anti-PR3 mAb. However, this mPR3 expression did not reach 3% of the level expressed by mPR3+ cells in the same conditions. 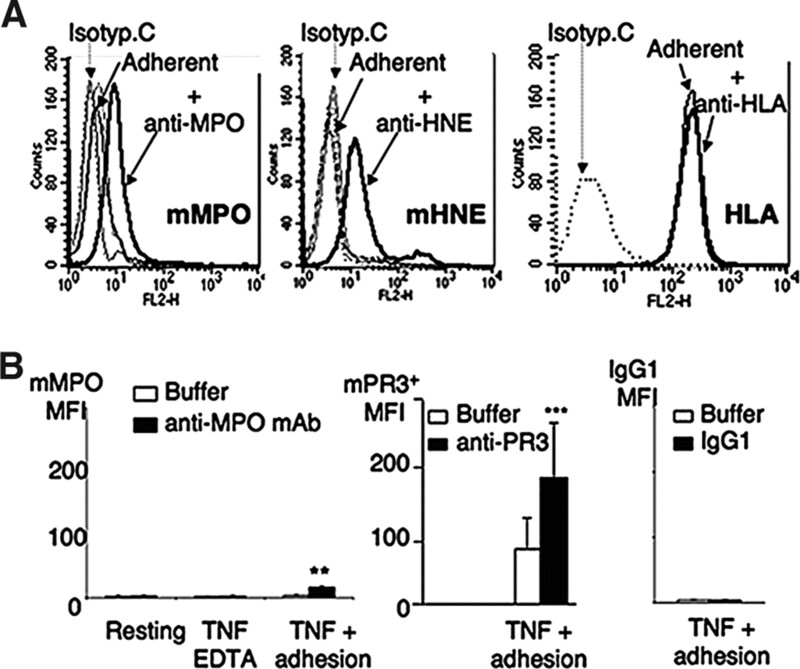 The Fc domain of ANCA or control IgG binds indistinctly to mPR3+ and mPR3− PMN subsets. As described previously,27 it leads to a high background that obscures the specific binding of anti–PR3-ANCA IgG (Figure 2A, left). The little shift of the ANCA IgG peak, as compared with normal IgG, was NS and was not observed with all normal IgG. Specific binding of anti-PR3 ANCA to mPR3+ neutrophils occurs, however (Figure 2A, right), and F(ab′)2 fragments of anti–PR3-ANCA labeled the same proportion of PMN as the anti-PR3 mAb. mPR3 expression upregulation by human anti-PR3 ANCA. (A) Binding of anti-PR3 ANCA IgG and F(ab′)2 to PMN from a donor bimodal in mPR3 expression. PMN activated by TNF-α in EDTA, as described in Figure 1, were labeled at 4°C with IgG (100 μg/ml) purified from a normal control (plain line) or from an anti-PR3 anti-neutrophil cytoplasmic autoantibodies (ANCA)-positive vasculitis patient (bold line, left) or with anti-PR3 ANCA F(ab′)2 (500 μg/ml; bold line, right), followed by a secondary FITC anti-human IgG antibody. The dotted line represents nonspecific binding of the secondary antibody and is superimposed, in the right diagram, with the peak obtained with control IgG F(ab′)2. ANCA and control human IgG bind nonspecifically to PMN, via their Fc domain, with no distinction of the mPR3+ and mPR3− subsets. Conversely, F(ab′)2 ANCA anti-PR3 specifically labels the mPR3+ subset. (B) Effect of ANCA anti-PR3 on mPR3 expression during PMN adhesion. PMN were activated as in Figure 1, in the presence or absence of human IgG, ANCA, or control (50 μg/ml). mPR3 expression was measured after labeling with biotin-labeled anti-PR3 mAb and PE-streptavidin. mPR3 flow cytometry histograms of TNF-α–activated PMN in EDTA (dotted line), adherent PMN (plain line), or PMN adherent in the presence of ANCA or control IgG (bold line) are shown. We took advantage of the fact that anti–PR3-ANCA do not hinder anti-PR3 mAb CLB 12.8 binding: The anti-PR3 mAb binding on mPR3+ PMN was not modified when 200 μg/ml anti-PR3+ patient IgG were added during labeling (data not shown). We thus used the biotinylated anti-PR3 mAb to quantify mPR3 after PMN adhesion with ANCA-IgG. A significant mPR3 upregulation was observed on adherent PMN treated with anti-PR3 ANCA IgG (Figure 2B). This was true of IgG from two of three patients with high anti–PR3-ANCA titers, with no effect observed with IgG from five of five control subjects and four of four anti–MPO-ANCA–positive patients (data not shown). We first looked for antibody-induced upregulations of neutrophil MPO or elastase. As shown in Figure 3, TNF-induced adhesion did not promote significant MPO or elastase membrane expressions. The presence of anti-MPO or anti-elastase mAb throughout adhesion resulted in a small, statistically significant membrane expression of MPO or elastase, respectively. However, such expressions, homogeneous within the neutrophil pool, represented <10% of the mPR3+ expression seen after PMN adhesion with anti-PR3 mAb (Figure 3B). Membrane myeloperoxidase (MPO), elastase (HNE), and HLA labeling after PMN adhesion. (A) Increase of membrane MPO and HNE expression during PMN adhesion (performed as described in Figure 1) in the presence of anti-MPO mAb and anti-HNE mAb (2 μg/ml), respectively (replacing anti-PR3 mAb described in Figure 1). The figure shows nonspecific binding of isotype-matched control antibody (dark dotted line) and binding of anti-MPO or anti-HNE mAb on resting PMN (light solid line), on TNF-α–activated PMN in EDTA (light dotted line), on TNF-α–activated adherent PMN (plain line), and on adherent PMN in the presence of either anti-MPO mAb or anti-HNE mAb (bold line; n = 4). No difference in membrane HLA was noted between TNF-α–activated adherent PMN (plain line) and those adherent in the presence of anti-HLA mAb (bold line; n = 3). (B) Membrane MPO (mMPO) levels, measured after TNF-α–induced PMN adhesion (performed as described in Figure 1) with anti-MPO, are compared with mPR3 levels (mPR3+ subset) of adherent PMN with anti-PR3 mAb. No modulation of nonspecific binding of IgG1 was observed during PMN adhesion with IgG1. Results are expressed as means ± SD of anti-MPO, anti-PR3, or IgG1 MFI, using PE-labeled secondary anti-mouse IgG antibody (n = 8). **P < 0.01. ***P < 0.001. No change of HLA A/B expression and no binding of IgG1 were observed when PMN adhered in the presence of anti-HLA mAb (Figure 3A) or IgG1 (Figure 3B), respectively. Then, neutrophils were allowed to adhere in the presence of various IgG1 mAb before analysis of mPR3 expression of the mPR3+ subset. This was enhanced only by anti-PR3 mAb and was not modified by isotypic IgG1 control, anti-MPO, or irrelevant anti-neutrophil mAb such as anti-CD43 or anti-HLA A/B, despite the high levels of membrane CD43 or HLA antigens reacting with these mAb (Table 1). 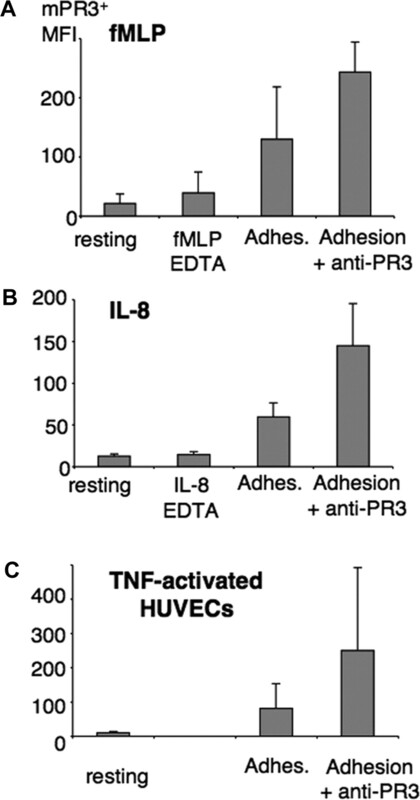 Incubation of TNF-α–activated PMN with F(ab′)2 anti-PR3 mAb during adhesion did not enhance mPR3 expression, emphasizing the role of Fcγ receptors (FcγR) in mPR3 upregulation (Table 1). However, nonspecific FcγR activation by 1 mg/ml heat-aggregated IgG during PMN adhesion was not sufficient to increase the mPR3 expression (Table 1). The presence of anti-PR3 antibodies during TNF-induced adhesion to gelatin (Figure 1), fibrinogen, or type I collagen (data not shown) upregulated mPR3 expression of the mPR3+ subset. Pretreating PMN with anti-CD18 blocking mAb (IB4), which resulted in 86% inhibition of cell adhesion (data not shown), significantly prevented the antibody-induced mPR3 upregulation (Figure 4A). TNF activation with this anti-CD18 mAb resulted, however, in a slight significant increase of PR3 expression similar to that observed with EDTA. Role of β2 integrin engagement in mPR3 upregulation. (A) PMN were pretreated with 10 μg/ml of a blocking anti-CD18 clone IB4 mAb (or control IgG1) for 20 min at room temperature before the adhesion experiment was performed as described in Figure 1. Conditions of resting and TNF-EDTA–activated PMN are also described in Figure 1. (B) PMN adhesion was induced, in the absence of TNF-α, by the addition of 1 mM Mn2+. (C) PMN adhesion was induced, in the absence of TNF-α, by anti-CD18 activation KIM 185 mAb. RestingHBSS−, PMN in HBSS with no Ca/Mg, incubated at 37°C for 45 min in BSA-coated tubes; IgG1 HBSS++, PMN incubated in HBSS++ at 37°C for 45 min with control IgG1 (30 μg/ml) in BSA-coated tubes; Adhesion, PMN in HBSS++, incubated for 45 min at 37°C in 1% gelatin–coated wells in the presence of either KIM 185 mAb (30 μg/ml) or TNF-α (20 ng/ml). ▪, same protocols performed in the presence of 2 μg/ml anti-PR3 mAb. Adhesion was performed as described in Figure 1. Nonadherent cells were removed by washing with HBSS++, and adherent cells were released by a 20-min incubation with ice-cold PBS-BSA-EDTA-azide. Suspended PMN (resting, TNF-EDTA, anti-CD18 blocking [A] and IgG1/HBSS++[C]) were also incubated in this buffer before labeling. The mPR3 MFI of the mPR3+ subset was obtained by flow cytometry after labeling with biotinylated anti-PR3 mAb and PE-streptavidin. Results are expressed as means ± SD of MFI (n = 4 [A], 3 [B], and 5 [C]). *P < 0.05. For further analysis if their role of in mPR3 expression, β2 integrins were switched into an active conformation by manganese (Mn2+) or by an anti-CD18 activating mAb (KIM 185)28 in the absence of TNF-α signaling. Both resulted in an enhanced mPR3 level on adherent cells, which was further increased by the presence of anti-PR3 throughout adhesion (Figure 4, B and C). Similar adhesion-dependent and anti–PR3-dependent mPR3 upregulations were observed with 20 ng/ml (Figure 1) or 2 ng/ml TNF-α and with IL-8 or formyl-methionyl-leucyl-phenylalanine (fMLP) (Figure 5). Background cell adhesion, observed in the absence of priming, with or without anti-PR3 mAb, resulted in slight nonsignificant increases of mPR3 expression (data not shown). Upregulation of mPR3 expression during IL-8–and formyl-methionyl-leucyl-phenylalanine (fMLP)-induced adhesion of PMN and during adhesion to preactivated endothelial cells. PMN were activated as described in Figure 1, where TNF-α was replaced by 2 μM fMLP (A), 25 ng/ml IL-8, (B) or TNF-preactivated human umbilical vein endothelial cells (HUVEC; see the Concise Methods section; C). Neutrophil adhesion to HUVEC-coated plates was performed in M199 medium. Adherent cells were detached in EDTA, and PMN finally were labeled with biotinylated anti-PR3 mAb and PE-streptavidin. (C) After adhesion to HUVEC, cells were also labeled with anti-CD146 to exclude CD146+ endothelial cells (see the Concise Methods section). Results are expressed as means ± SD of mPR3 MFI from three experiments. Finally, neutrophils were allowed to adhere to TNF-α–preactivated human umbilical vein endothelial cells (HUVEC) to mimic further the situation occurring in ANCA vasculitis. This caused a 11 ± 4-fold increase of mPR3 expression of the mPR3+ subset, which further doubled when the anti-PR3 mAb was present during adhesion (Figure 5). Mobilization of secretory vesicles and specific and azurophilic granules during PMN activation and adhesion with anti-PR3 mAb and during artificial degranulation. Neutrophils were activated as in Figure 1 and labeled with mAb specific for membrane markers of secretory vesicles (FITC–anti-CD35), of secretory vesicles and specific granules (FITC–anti-CD11b; top), or of azurophilic granules (PE–anti-CD63; middle). mPR3 expression of the mPR3+ subset was measured in parallel. Results are expressed as means ± SD of MFI (n = 5). The table shows mPR3 upregulation and azurophil granule mobilization observed after TNF-induced adhesion with anti-PR3 and after artificial degranulation promoted by cytochalasin B and fMLP or by calcium ionophore. PMN degranulation was performed as follows: 2 × 106/ml neutrophils in HBSS++-BSA were incubated at 37°C with calcium ionophore A23187 (1 μM and Ca2+ 5 mM) for 15 min or with cytochalasin B (10 μg/ml) for 10 min then fMLP 10−6 M for 5 min. TNF-induced adhesion with or without 2 mg/ml anti-PR3 mAb was performed as described in Figure 1. Markers of azurophilic granule exocytosis were CD63 levels, measured by flow cytometry and MPO release in the cell supernatant, measured enzymatically. Results are given as means ± SD (n = 11). TNF-α–induced PMN adhesion further enhanced CD11b membrane expression, indicating specific granule mobilization. Adhesion in the presence of anti-PR3 mAb again amplified CD11b levels and resulted in a slight expression of CD63, a marker of azurophilic granules. However, CD63 expression did not reach 3% of the levels observed after maximum degranulation by fMLP/cytochalasin or by calcium ionophore A23187 (Figure 6, table). Similarly, the amount of MPO released in supernatants of TNF-α–activated neutrophils, with or without anti-PR3 mAb, was <10% (detection threshold) of the amount released after total degranulation. Neutrophil adhesion in the presence of anti-PR3 thus resulted in little mobilization of azurophilic granules. 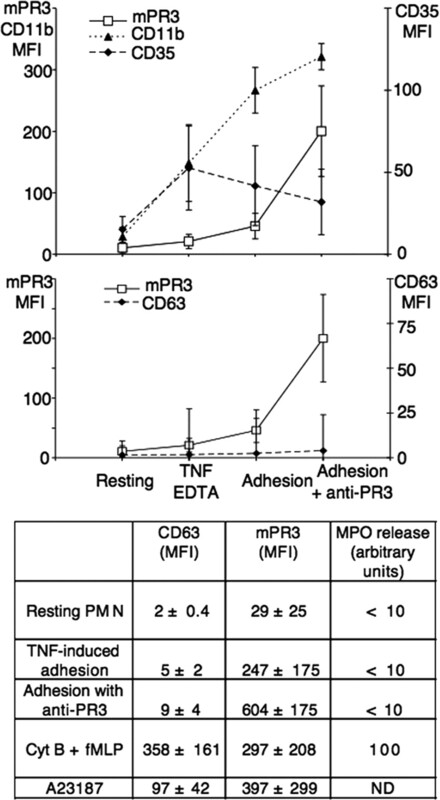 Surprising, after PMN extensive degranulation by fMLP/cytochalasin, leading to maximum CD63 expression and MPO release, mPR3 expression did not reach the levels observed after PMN adhesion in the presence of anti-PR3 (Figure 6, table). We assessed putative apoptosis-related membrane flip-flop, resulting from cell adhesion or mechanic recovery of adherent cells, by measuring annexin V binding. Less than 10% of annexin-positive cells were detected after adhesion, with or without anti-PR3 mAb (data not shown). A close association between CD177 and mPR3 was recently reported, suggesting that CD177 itself mediates PR3 membrane expression.30,31 We therefore analyzed CD177 during mPR3 upregulation. As expected, there was a bimodal distribution of CD177 on PMN (Figure 7A), and we confirmed, by double labeling, that the CD177+ and mPR3+ subsets are identical (data not shown). Comparison of mPR3 and CD177 expression of PMN. (A) Representative flow cytometry histograms of PMN from a healthy donor with the same mCD177 (left) and mPR3 (right) bimodal expression pattern, showing 60% mPR3+ and CD177+ PMN. (B) Modulation mPR3 and mCD177 expression (positive PMN subsets) during PMN activation by TNF-α and adhesion. Conditions of TNF-α activation and adhesion are those described in Figure 1. PMN were labeled with FITC–anti-CD177 (□) or anti-PR3 (□). Results are expressed as means ± SD of MFI of five experiments. *P < 0.05. CD177 expression of the mPR3/CD177+ subset nearly doubled after TNF-α activation in EDTA. However, contrasting with mPR3, CD177 levels were not further upregulated by adhesion, regardless of whether anti-PR3 mAb was present (Figure 7B). As already mentioned, plasma factors such as A1AT seem to inhibit the binding of anti-PR3 antibodies to mPR3+ PMN: When neutrophil incubations and labeling were performed in undiluted autologous plasma, no mPR3 was detected on resting PMN or upon TNF-activation in EDTA (Figure 8). However, TNF-induced adhesion allowed anti-PR3 mAb binding to mPR3+ PMN in plasma. Increased binding was obtained when the anti-PR3 mAb, diluted in plasma, was present throughout adhesion. The increase of mPR3 expression during PMN adhesion overcomes the inhibition of anti-PR3 mAb access to mPR3 by plasma. PMN in plasma (heparinized plasma from the same donor as neutrophils) or in HBSS-BSA were activated and analyzed for mPR3 expression as in Figure 1. The presence of plasma prevented the binding of anti-PR3 mAb to suspended PMN (resting or TNF-EDTA) but allowed it after cell adhesion. The numbers refer to the mPR3+ MFI of the mPR3+ neutrophil subset. Similar experiments were performed with and without 100 μg/ml ANCA-PR3+ human IgG diluted in plasma. As previously mentioned, the binding of ANCA antibodies could not be assessed directly because of the nonspecific binding of IgG (Figure 2). The effect of ANCA was therefore measured using the anti-PR3 mAb. We observed a 2.4-fold increase of mPR3 expression when ANCA antibodies, diluted in plasma, were present throughout adhesion, as compared with PMN adherent in plasma without ANCA (data not shown). This clearly demonstrates the ANCA–anti-PR3 interaction with adherent PMN in plasma. We show that neutrophil activation by inflammatory stimuli, cell adhesion, and anti-PR3 mAb leads to step-wise increases of mPR3 available to ANCA. PMN priming is required for ANCA-induced PMN activation.9,32 Priming by TNF-α, platelet-activating factor (PAF), or LPS induces a PR3 translocation to the cell surface, enhanced upon further activation by IL-8 or fMLP.33,34 As shown here, the adhesion process and the presence of anti-PR3 antibodies amplify the mPR3 upregulations induced by TNF-α, IL-8, fMLP, or activated HUVEC. Of interest, mPR3 expression is restricted to a constant neutrophil subset in all of these conditions.5 The following discussion refers to the mPR3+ subpopulation and does not address the question of the fundamental differences between mPR3+ and mPR3− subsets. FcγR and β2 integrins are known to be involved in ANCA-induced PMN activation.27,34–37 The originality of our work is to show that these effects can be explained, at least in part, by the striking upregulation of ANCA antigen expression promoted by β2 integrin-dependent adhesion and amplified by ANCA. The role of β2 integrins is demonstrated here, because anti-CD18 blocking mAb prevent the adhesion-dependent mPR3 upregulation. Conversely, anti-CD18 activating mAb enhance the mPR3 expression by promoting adhesion in the absence of TNF priming. The lack of effect of F(ab′)2 anti-PR3 antibodies on neutrophil mPR3 expression emphasizes the role of FcγR. We demonstrated for the first time an amplifying loop in PMN activation: ANCA are involved in membrane expression of their own specific antigens. 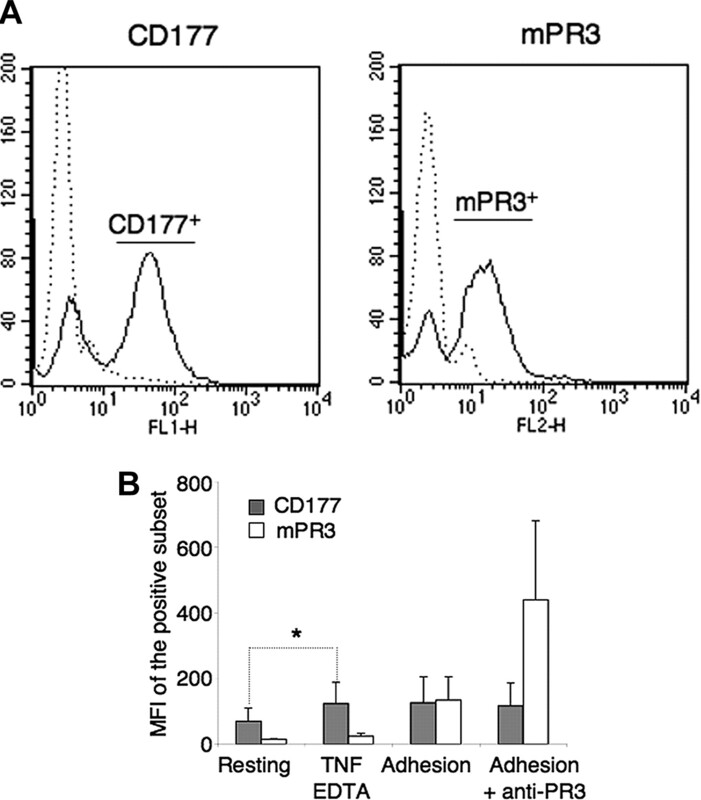 Recent data have suggested that PR3 membrane expression would result from mPR3 close association with CD177.30,31 We confirm that CD177, exclusively present on the mPR3+ neutrophil subset, is upregulated as mPR3 by TNF-α activation without adhesion. However, unlike mPR3, CD177 level is not further enhanced by cell adhesion and by anti-PR3 antibodies. This suggests the existence of two mPR3 species: mPR3 molecules that are present on resting PMN and recruited after limited activation and degranulation would form a complex with CD177, as previously suggested.31 New mPR3 molecules that are translocated to the membrane upon adhesion, especially in the presence of anti-PR3, may not be associated with CD177. We cannot exclude, however, that each CD177 can bind several mPR3 molecules and that CD177 molecules that are expressed on resting PMN are sufficient to anchor newly recruited mPR3 after cell adhesion with anti-PR3 antibodies. We previously showed that intracellular storage pools of PR3 are located not only in azurophilic but also in specific granules and secretory vesicles.42 TNF activation is sufficient to mobilize secretory vesicles and possibly tertiary granules.26,29 This results in a first increase of mPR3 expression, together with exposure of the secretory vesicle marker CD35 and with CD11b upregulation. TNF-induced adhesion further mobilizes specific granules, enhancing CD11b and mPR3 expression at the same time. Membranes of the fused vesicles or granules seem to be richer in CD11b than in mPR3, because CD11b expression increases twice more than mPR3 during cell adhesion. The opposite situation is observed when anti-PR3 antibodies are present during adhesion, when mPR3 levels increase four times more than CD11b. The origin of these newly appearing mPR3 molecules therefore is not limited to secretory vesicles and specific granules. Some may result from an azurophilic granule exocytosis, suggested by the slight shift of CD63 labeling and the decrease, possibly elastase-dependent, of CD35 expression.43 However, azurophilic granules are unlikely the only source of the impressive mPR3 upregulation occurring during adhesion with anti-PR3 antibodies—first because their exocytosis is very limited and second because maximum degranulation of azurophilic granules and all other vesicles, by fMLP/cytochalasin or Ca ionophore, was not sufficient to reach similar mPR3 levels. Apart from secretory vesicles and granules, an intracellular localization of PR3 at the inner face of the plasma membrane has been proposed to explain the increase of mPR3 expression on apoptotic cells.44 In our experimental settings, mPR3 upregulation occurred without apoptosis. However, transient phospholipid flip-flop also occurred during PMN activation,45 and constant recycling of membrane PR3 was recently described.35 Whether TNF-induced adhesion results in a similar phenomenon deserves further studies. It might promote a transient PR3 molecule transfer from the inner to the outer plasma membrane leaflet. We hypothesize that anti-PR3 antibody binding would then prevent this PR3 to be re-internalized. As previously reported,46 TNF activation increased mPR3 but did not result in MPO membrane expression. Although we were able to detect some membrane MPO or elastase on adherent PMN with specific anti-MPO or -elastase mAb, these expressions were far less important (<10%) than mPR3 levels. They could result from the nonspecific binding of fluid phase MPO and elastase, released during TNF-induced adhesion, and likely bind neutrophil membranes as a result of their positive charge. The same mechanism could explain the low mPR3 levels detected on the mPR3− subset in response to TNF-induced adhesion in the presence of anti-PR3 antibodies. Finally, confirming our initial working hypothesis, our results show that PMN adhesion favors the access of anti-PR3 mAb or ANCA to their antigens in whole blood. We have shown that cytokine activation, cell adhesion, and the presence of anti-PR3 antibodies are three conditions required to allow a maximal mPR3 expression and an efficient binding of anti-PR3 antibodies to PMN in plasma. This would explain, at least in part, that vascular lesions observed in ANCA-associated vasculitis are restricted to capillaries and postcapillary venules, where small vessel diameters and low blood flow allow PMN adhesion to the endothelium. Anti-PR3 (CLB-12.8) and anti-MPO (7.17) mAb were from Sanquin (Amsterdam, Netherlands), anti-elastase mAb was from Biogenesis (Poole, UK), anti-CD43 was from BD Pharmingen (San Diego, CA), FITC-conjugated F(ab′)2 anti-human IgG was from Jackson ImmunoResearch (West Grove, PA), FITC–anti-CD177 mAb (MEM-166) was from Biolegend (San Diego, CA), and FITC–anti-CD146 was from Serotec (Oxford, UK). Anti-CD18 clone IB4 was from Ancell (Bayport, MN), and KIM-185 was provided by M. Robinson (CellTech, Cambridge, UK). Other antibodies were from Beckman Coulter (Roissy, France). TNF-α was from PeproTech (Rocky Hill, NJ), IL-8 was from R&D Systems (Abingdon Oxon, UK), fibrinogen was from Diagnostica Stago (Genevilliers, France), and collagen I was from Invitrogen (Palo Alto, CA). Other reagents were from Sigma (St. Louis, MO). PMN from healthy donors, prepared as described previously,47 were suspended (2 × 106/ml) in BSA 0.1% HBSS (Life Technologies, Paisley, UK) without (HBSS−) or with (HBSS2+) 1 mM Ca2+/Mg2+ or with 10 mM EDTA (HBSS-EDTA). Protocols used for PMN activation and adhesion are given in corresponding figure legends. Endothelial cells were isolated from human umbilical cord veins as described previously48 and cultured in M199 medium (Life Technologies) with 20% FCS. They were subcultured in 48-well culture plates coated with 0.5% gelatin and pretreated for 4 h with 10 ng/ml TNF-α. After rinsing three times with medium, they were used as substrate for PMN adhesion, as described in Figure 5. After stimulation, PMN were washed in ice-cold PBS, 1% BSA, and 0.1% sodium azide and incubated at 4°C with unlabeled or biotinylated primary antibody, followed by PE-labeled secondary antibody or streptavidin. When anti-PR3 antibodies were present during PMN activation, similar results were obtained whether labeling was performed directly with the secondary antibody or a new sample of anti-PR3 mAb was added after adhesion. Cell suspensions recovered after PMN adhesion to HUVEC were labeled with anti-PR3 mAb and with FITC–anti-CD146. mPR3 expression was analyzed after exclusion of CD146+ HUVEC. Cells were analyzed by flow cytometry on a Becton Dickinson FACSCalibur (Mountainview, CA). Results are given as mean fluorescence intensity. Mean fluorescence intensities were compared using a paired t test analysis. S.B. and A.M. were supported by grants from the Fondation Nationale d'Aide aux Insuffisants Renaux and from the Association pour la Recherche sur la Polyarthrite Rhumatoïde, respectively. We acknowledge support from Baxter, Amgen, and AURA. Part of our results were previously reported as abstracts at the annual meetings of the American Society of Nephrology; November 8 through 13, 2005, Philadelphia, PA; and November 14 through 19, 2006; San Diego, CA. We thank Martyn Robinson (CellTech, Cambridge, UK) for the invaluable gift of the anti-CD18 activating KIM185 mAb.